18 July, which is Nelson Mandela’s birthday, was declared by the United Nations General Assembly (UNGA) as Nelson Mandela International Day in 2010. The celebration of this international day recognises and gives credence to the former President’s commitment to human rights, conflict resolution and reconciliation. President Jacob Zuma will this year mark Nelson Mandela Day by officially handing over houses to the community of Danville, Pretoria West on 18 July. Other events that will take place include schools all over South Africa uniting in song to wish Mr Mandela a happy birthday at 08:00. 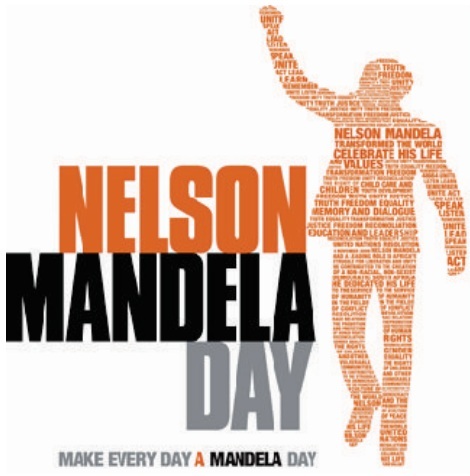 Government has organised a number of events for Mandela Day, and public servants will also devote at least 67 minutes of their time to make South Africa a better place. The Mandela Day Campaign message encourages people to use 67 minutes of their time to support a chosen charity or serve in their local community. The 67 minutes symbolically represent the number of years the former President fought for human rights and the abolition of apartheid. Mandela Day is a call for action for individuals – for people everywhere – to take responsibility for changing the world into a better place, one small step at a time, just as Mr Mandela did. This day recognizes the icon’s leading role in and support for Africa’s struggle for liberation and unity, and his outstanding contribution to the creation of a non-racial, non-sexist democratic South Africa. July 18, 1918 Ro­lih­lahla Man­dela is from a roy­al fam­ily of the Thembu ethnic group, the Xhosa people, in Mvezo, South Africa. He was giv­en the name Nel­son by his teach­er on the first day of school. 1942 Man­dela be­gins at­tend­ing Afric­an Na­tion­al Con­gress meet­ings. 1944 Man­dela mar­ries Evelyn Ntoko Mase. They have four chil­dren to­geth­er be­fore divor­cing in 1958. May 26, 1948 South Africa Prime Min­is­ter Jan Smuts is de­feated in his bid for reelection. The Na­tion­al Party comes to power ad­voc­at­ing a policy of Apartheid, meaning “apart­ness.” New laws are im­ple­men­ted co­di­fy­ing ra­cial dis­crim­in­a­tion. 1951 Man­dela be­comes pres­id­ent of the ANC Youth League, which he helped found with Oliv­er Tambo and Wal­ter Si­s­ulu. The Youth League cam­paigns for the re­peal of dis­crim­in­at­ory laws. December 1952 Man­dela and Tambo open South Africa’s first black law firm in cent­ral Jo­han­nes­burg. December 5, 1956 Man­dela is de­tained along with 155 oth­ers and charged with treas­on. The tri­al, which lasts un­til 1961, ends in ac­quit­tal. June 1958 Mar­ries Nomzamo Win­ni­fred Madikizela, bet­ter known as Win­nie. They even­tu­ally have two daugh­ters to­geth­er — Zenani, born in 1959, and Zindziswa, in 1960. April 1960 The South Afric­an gov­ern­ment out­laws the Pan Afric­an­ist Con­gress and the ANC. 1963 With Man­dela in jail, po­lice raid ANC of­fices in Rivo­nia and seize doc­u­ments out­lining a guer­rilla cam­paign against the gov­ern­ment. Man­dela and nine oth­ers are charged with sab­ot­age and con­spir­acy to over­throw the gov­ern­ment. April 20, 1964 Man­dela’s “I am pre­pared to die” state­ment from the dock at the open­ing of the de­fense case in the “Rivo­nia” tri­al. June 12, 1964 Judge Quartus de Wet sen­tences Man­dela and sev­en oth­er foes of apartheid to life in pris­on. April 1982 Nel­son Man­dela is moved to Poll­s­moor Pris­on in Cape Town. He is al­lowed to see and touch his wife and daugh­ters for the first time in 20 years as the usu­al glass bar­ri­ers and mi­cro­phones are dis­pensed with. Oct. 3, 1983 Man­dela has been in pris­on for more than 20 years. The 65-year-old head of the out­lawed ANC con­tin­ues to be the in­spir­a­tion­al lead­er of South Africa’s black na­tion­al­ist move­ment. Feb. 10, 1985 Man­dela re­jects South Afric­an terms for con­di­tion­al free­dom and in­stead sets forth his own terms for ne­go­ti­ations between his out­lawed or­gan­iz­a­tion and the na­tion’s white re­gime. South Afric­an Pres­id­ent Pieter W. Botha, in a ges­ture meant to demon­strate his gov­ern­ment’s com­mit­ment to re­form, had offered to free Man­dela and oth­er black na­tion­al­ist lead­ers if they re­nounced vi­ol­ence as a means of fight­ing apartheid and agreed to obey the coun­try’s strict in­tern­al se­cur­ity laws. “I can­not and will not give any un­der­tak­ing at a time when I and you, the people, are not free,” Man­dela said in a mes­sage from his pris­on cell in Cape Town, where he was serving the life sen­tence im­posed in 1964 after his con­vic­tion on charges of sab­ot­age and plot­ting re­volu­tion. Aug. 12, 1988 Man­dela con­tracts tuber­cu­los­is in pris­on and is hos­pit­al­ized at Ty­ger­berg Hos­pit­al in Cape Town. Dec. 8, 1988 Man­dela is moved to Vic­tor Ver­ster Pris­on. The trans­fer marks the first time since 1962 that he has lived out­side a pris­on cell, oth­er than hos­pit­al stays. It is widely viewed as the be­gin­ning of a “phased re­lease” for Man­dela. July 18, 1989 After 27 years in South Afric­an pris­ons, free­dom looms for Man­dela. Gov­ern­ment of­fi­cials say his re­lease, while not pos­sible be­fore Septem­ber elec­tions, may nev­er­the­less be only a mat­ter of months away. Feb. 11, 1990 Man­dela is re­leased after 27 years in pris­on to throngs of sup­port­ers. Read Man­dela’s ad­dress to a rally in Cape Town on his re­lease from pris­on. June 29, 1990 Man­dela comes to Los Angeles on the last leg of an eight-city U.S. tour and in a series of ad­dresses asks Hol­ly­wood celebrit­ies and in­ner-city stu­dents alike to keep fight­ing against white minor­ity rule in South Africa. July 5, 1991 Man­dela is elec­ted pres­id­ent of the Afric­an Na­tion­al Con­gress. The vot­ing at the 2,000-del­eg­ate na­tion­al ANC con­fer­ence, the first such leg­al gath­er­ing of the or­gan­iz­a­tion in South Africa in more than three dec­ades, gives Man­dela and a new slate of lead­ers a strong man­date to speak for the black ma­jor­ity in cru­cial con­sti­tu­tion­al ne­go­ti­ations ex­pec­ted later in the year. 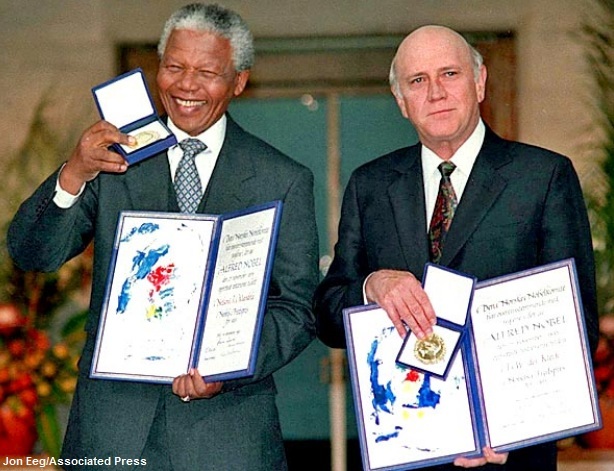 Dec. 10, 1993 Man­dela shares the No­bel Peace Prize with South Afric­an Pres­id­ent Fre­derik W. de Klerk for their joint lead­er­ship of a ne­go­ti­ated trans­fer of power from the white minor­ity to the black ma­jor­ity. 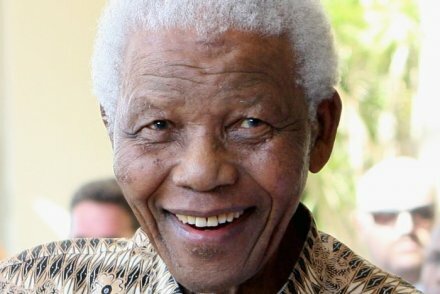 May 2, 1994 Man­dela, 75, de­clares vic­tory in South Africa’s first all-race elec­tion on be­half of his Afric­an Na­tion­al Con­gress party. In an emo­tion­al speech be­fore an ec­stat­ic crowd, the sil­ver-haired lead­er of the Afric­an Na­tion­al Con­gress calls the suc­cess of his polit­ic­al and ra­cial re­volu­tion “a joy­ous night for the hu­man spir­it” and urges his still-stunned coun­try to “cel­eb­rate the birth of demo­cracy.” A week later, Par­lia­ment un­an­im­ously elects him pres­id­ent. May 10, 1994 Man­dela is sworn in as South Africa’s first black pres­id­ent by Chief Justice Mi­chael Corbett in Pre­tor­ia. Princes, pres­id­ents and prime min­is­ters — 6,036 dig­nit­ar­ies in all, from nearly every coun­try in the world — watch as Man­dela strides to the po­di­um, care­fully puts on his gold read­ing glasses and be­gins to read the 133-word oath of of­fice. May 24, 1994 In his first State of the Na­tion speech Man­dela out­lines his vis­ion for South Africa. The na­tion­ally tele­vised speech be­fore a joint ses­sion of the mul­tiracial Na­tion­al As­sembly and Sen­ate in the Par­lia­ment build­ing in Cape Town sets a heal­ing tone and a mod­er­ate course for the new demo­cracy as it struggles to shed the so­cial and eco­nom­ic in­equit­ies of apartheid. Oct. 6, 1994 Man­dela ad­dresses a joint ses­sion of the U.S. Con­gress. Aug. 18, 1995 Man­dela’s law­yer says the pres­id­ent seeks an am­ic­able di­vorce from his es­tranged wife, Win­nie. Man­dela leg­ally sep­ar­ated from her in April 1992, two years after his re­lease from pris­on. March 19, 1996 Man­dela and Win­nie are di­vorced after an emo­tion­al two-day tri­al that forces him to pub­licly ac­cuse her of adul­tery. Dec. 16, 1997 Ad­dress­ing the open­ing ses­sion of a weeklong ANC con­ven­tion, at which he will of­fi­cially re­tire as ANC lead­er, Man­dela gives a sting­ing farewell speech, ac­cus­ing some white South Afric­ans of try­ing to sab­ot­age the coun­try’s new demo­cracy. July 17, 1998 Man­dela mar­ries Graca Machel of Mozam­bi­que on his 80th birth­day. The couple, who met in 1990 shortly after Man­dela was re­leased from pris­on, have been pub­licly see­ing each oth­er for about two years. Machel, 52, is a law­yer and the wid­ow of Mozambic­an Pres­id­ent Sam­ora Machel. June 14, 1999 After five years in of­fice, Man­dela’s pres­id­en­tial term comes to an end. Del­eg­a­tions from more than 100 coun­tries, in­clud­ing a U.S. con­tin­gent headed by Atty. Gen. Janet Reno, are on hand to wit­ness his re­tire­ment and the swear­ing-in of his suc­cessor, Thabo Mbeki. October 2010 His book “Con­ver­sa­tions With My­self” is re­leased with a fore­word by Pres­id­ent Barack Obama. In the usual Thembu custom Nelson Mandela school meant initiation at 16 and attendance at Clarkebury Boarding School. Instead of taking the usual 3 years to complete his Junior Certification Nelson was through in 2 years. From there he went (in 1937) to the usual college for Thembu royalty – Healdtown in Fort Beaufort. At the Fort Hare University, an elite black institution in Alice, Eastern Cape, Nelson Mandela became involved in the Student Representative Council. Following a boycott there he was told to leave and the Nelson Mandela education took a change of direction. Rather than follow through on his guardians wish for an arranged marriage the young Nelson took off to Johannesburg. He completed his Bachelor of Arts studies there through the University of South Africa. Mandela then went on to study law at the University of Witswatersrand and was the only native student. Nelson Mandela university life was interrupted by his involvement in the ANC. He and friend Oliver Tambo opened the first black legal practice in South Africa, giving affordable and often free advice to black people who could otherwise not afford it. Mandela continued his legal education while he was in prison too. When he was put into Robben Island prison Mandela often gave legal advice to both prisoners and prison staff. Mandela saw education as part of the key to winning the struggle against apartheid. For many of his 27 years of imprisonment, Nelson Mandela studied Law as a University of London External student. He passed the London Intermediate exams in 1963, but the conditions imposed by the South African authorities prevented him from completing his degree in the later 1960s and 1970s.